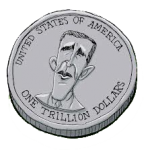 It has been proposed that the Treasury mint and issue a trillion dollar coin. Why? Is it the stupidest thing you’ve ever heard? I mean, really…I can’t get most vending machines to take a perfect dollar bill without barfing it back at me, and the Government wants to mint a trillion dollar coin? Really though, how is that different than running the printing presses night and day to print up money, which because we have a fiat currency, they can do anyway? This is much cheaper. 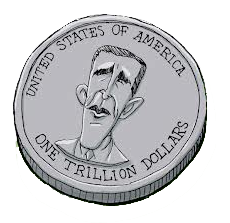 There’s also the possibility that the government, after minting the big coin, will say to China “hey, Chinaman, call in all your Treasury Bills you hold (basically IOUs we print to get them to loan us money) and we’ll be happy to pay them off, with this shiny, new platinum $1 Trillion Dollar coin. There you go, Wo-Fat. Piss off.